After graduating from Truman in May 2006 with a bachelor’s degree in history and a minor in psychology, I attended Southern Illinois University. 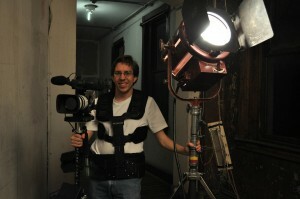 There I studied film, focusing on documentary, and earning my MFA in May 2009. While there were several outstanding professors with whom I worked, the overall quality and academic rigor of that institution paled in comparison to Truman’s. I learned a great deal about the filmmaking craft at SIU, but I will always regard Truman as where I gained the necessary abilities to tell non-fiction stories in an engaging and ethical manner. Thanks to the skills I learned through TSU’s stellar history program, after grad school I was hired to research and write a feature-length documentary on the Battle of Wilson’s Creek, the second major battle of the Civil War and the first in Missouri. Completed in April of this year, it is expected to air in 2011 on PBS. I have also completed an 58-minute documentary on the life of James Polk, a project that was inspired by one of my favorite courses at Truman, The Jackson Era, helmed by Dr. Mark Hanley. That film recently played in Kansas City and is now in the review process for broadcast as well. To support myself and my ongoing documentary projects, I work as a freelancer in the Kansas City area, doing everything from digitally preserving motion picture and photographic archives, to filming commercials and live events. When work is slow, I make animated films, and restore classic pieces of Americana, like soda fountain mixers and tube radios. When work is REALLY slow, I’ll hammer out my worries on a nice six- or eight-mile run. I keep in touch with as many Truman alumni as I can, and I try to make it back each year for Homecoming, to see old friends and compete in the Bulldog 5K. If I have one regret in life, it’s opting to graduate from Truman in three years. Not a day goes by where I don’t wish that I had spent just one more year with the friends and professors I hold dear. Brian created a short film for the Association of Moving Image Archivists which held a competition for films on the importance of film preservation. Brian’s submission took top honors and was recently screened for their national convention in Philadelphia.